This was the question posed by Dr. Kathryn Hadler in her talk at the inaugural event for the Camborne School of Mines' Women in Mining student chapter earlier in the month (posting of 15th March). I was invited by the newly formed Women in Mining Student Chapter at CSM to give a talk on women in mineral processing, given that it was International Women’s Day on Tuesday 8th March, the timing seemed particularly appropriate. The International Mineral Processing Council (IMPC) currently has a female presence of 5% (i.e. Diana Drinkwater). Is this representative of the proportion of women in mineral processing (industry and academia)? What data do we have at our disposal to investigate this further? Fortunately, the IMPC Commission on Education proves a good starting point, providing mineral processing graduate numbers by region, the proportion entering industry and the proportion that are female. Using these published numbers, an estimate (with an emphasis on the word estimate!) of the proportion of female mineral processing graduates entering industry can be calculated, and this turns out to be 14%, or 1 in 7. Of course, we know that many people entering the industry do not have degrees specifically in mineral processing, however in the absence of any other data to hand, this seems like a reasonable place to start. So, 14% of graduates entering the industry are female. How does this reflect industry and academia? Where does one find such data? Well, one assumption we can make is that people attending conferences are representative of the gender balance of industry and academia as a whole. Is this assumption valid? Well, there are limitations, but again, it seems a good place to start. To investigate further, I took delegate lists from selected MEI conferences and categorised people by gender, industry/academia and geographical region. Before we launch into the results, here are some caveats: 1) People attending conferences are not necessarily from a technical background. 2) No account is made for seniority or position within industry/academia. 3) People enter academia from many disciplines (e.g. chemical engineering). 4) People often do not work in the same place from which they graduated. 5) The proportion of academics and industry delegates is unlikely to reflect reality, given that a conference will tend to attract a greater proportion of academics. So let’s start with the most recent MEI conference; Flotation ’15 in Cape Town last November. There were 238 delegates, of which 65% were from industry and 40% were from Africa (predominantly South Africa). Of all delegates, 19% were female. This is encouraging; it is higher than the 14% female entering industry and much higher than the 5% represented on the IMPC. Separating further by academia and industry, 27% of academics attending the conference were female with 14.5% of industry folk being women. Breaking down the data by region, 45.5% of the academics from Africa were female, whereas 20% were female from Europe. On the other hand, only 12% of the industry delegates from Africa were women, compared to 17% from Europe. These are interesting figures; I am not going to discuss them in any detail here, but there is certainly variation by region, which is evident from all the data into which I looked. The next question is ‘has this changed over time?’ Well, let’s compare the proportion of female delegates at three Flotation conferences (’03, ’07 and ’15), which is shown in Figure 1. 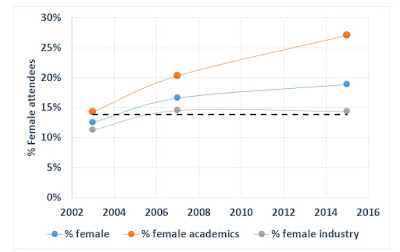 The dashed horizontal line represents the proportion of female graduates entering industry (14%). It’s interesting to see that over time, the proportion of women in academia attending flotation conferences has increased, while there is no corresponding increase in those from industry, hovering around the 14-15% mark. 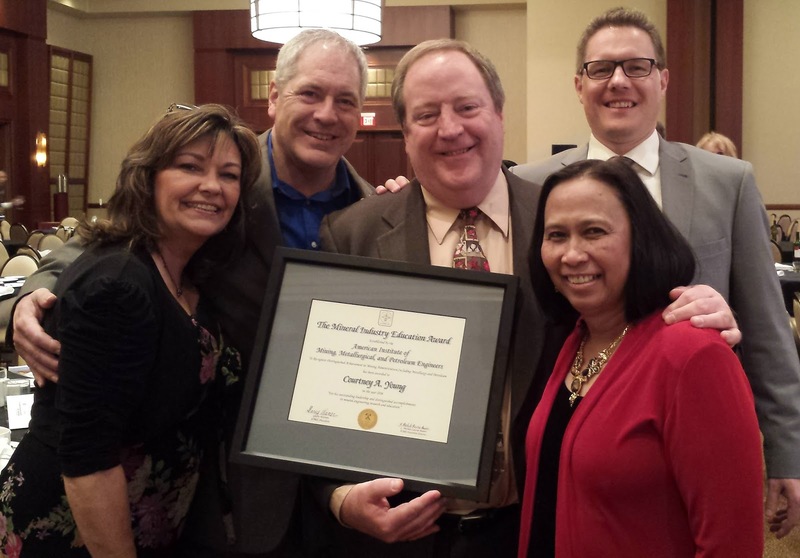 ﻿Is flotation representative of other mineral processing sectors? We can compare it to any of the MEI conferences, however I’ve selected Process Mineralogy ‘14 and Comminution ‘14, both of which were held in Cape Town. 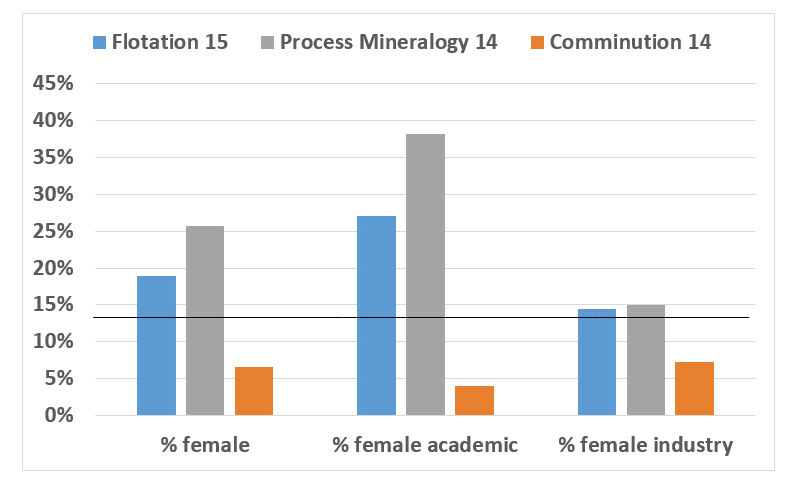 You can see the results in Figure 2, where women account for a much greater proportion (38%) of the academic delegates in Process Mineralogy (although female industry delegates remain at around 15%), whereas Comminution seems to have attracted very few women in any sector. Perhaps this is reflected in the 5% that is represented on the IMPC?! Which brings us back to our figure of 1 in 7. So, do these numbers seem realistic? Is it a cause for concern or does this point to a bigger issue about attracting into (and keeping) a greater diversity of people in the industry? We would be interested in receiving your comments on Kathryn's summary. Easter Sunday with Amanda and family before they leave for holiday in Zimbabwe and Namibia on Tuesday. 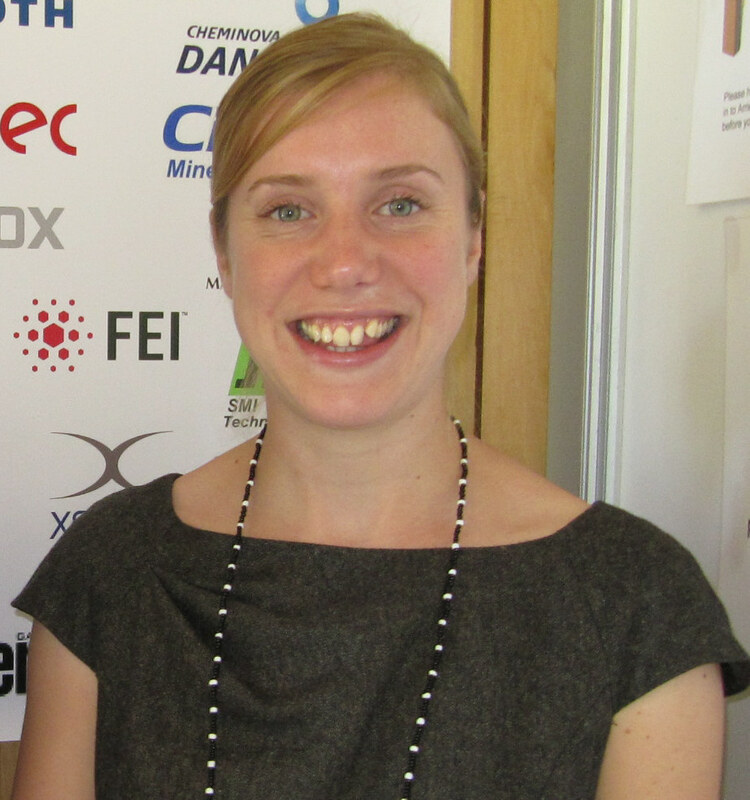 Amanda joins the rest of the MEI team two weeks today in Cape Town for Comminution '16. In three months' time MEI's 8th Biohydrometallurgy conference begins in Falmouth. One of our consultants to this conference is Prof. Sue Harrison, and she, and her strong team from the University of Cape Town, will be co-authoring seven papers at the conference. 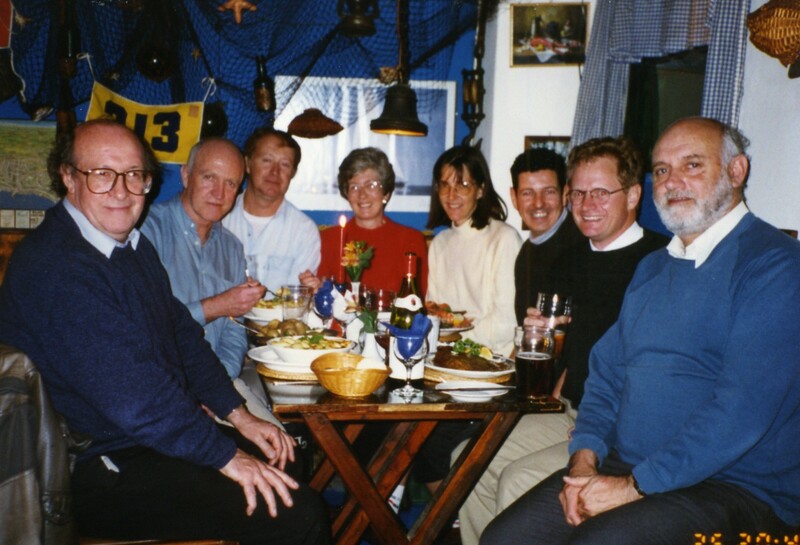 Sue was also a delegate at the first biohydrometallurgy conference in Falmouth, which began 20 years ago yesterday. Biotech '96 was attended by 40 mineral processors and biologists from 17 countries, representing North and South America, Africa, Europe, Australia, India and Japan. In those pre-blog days I took very few photos at conferences, but one that has survived is shown below. It was taken on the second evening of the conference at Falmouth's Seafood Bar, and left to right are Jim Watson (UK), me, John Wells (Chile), Barbara, Sue Harrison (South Africa), Jan Cilliers (UK), Frank Crundwell (South Africa) and Andy Sarosi (UK). I don't remember a great deal of the conference, but it would be great if those of you who attended could share your memories. Portreath is a small village on the north coast of Cornwall. It was once home to many students from the nearby Camborne School of Mines until CSM moved to Penryn on the south coast in 2004. Last night Portreath's Waterfront Inn made its debut as the venue for the Cornish Mining Sundowner, attended by many of the regulars, but with a few surprise appearances. It was a very pleasant surprise to see Ollie and Colin Pike after many years. Ollie was on the secretarial staff at CSM from 1992 to 2010. She and Colin now live in Spain and were making a brief visit to Cornwall to see family. Also on a flying visit was Pete Taylor of Mammoth Mining, UK, who I last saw in Cape Town last month at Indaba '16, along with Kim-Marie Clothier and her business partner John Eyre of North Coast Consulting. Also good to see John's son, mining engineer Dr. Matt Eyre. Unfortunately I will miss the next sundowner which will be held in Penzance on April 21st. The technique of Positron Emission Particle Tracking (PEPT), invented at the University of Birmingham, UK, enables a single radioactive tracer particle moving inside a piece of equipment to be tracked accurately at speeds up to 2ms-1. The University of Cape Town has a well established team which has investigated the use of PEPT for systems such as tumbling mills, hydrocyclones, IsaMill™, vibrating screens and flotation cells. The capabilities of particle tracking and data processing to extract granular flow features required for modelling are well developed within the team. Typical particles that can be tracked using this method include steel balls, ceramic beads, and particles as small as 50 µm, which are typical rock fragments found in flotation and some comminution devices. For those attending Comminution '16 next month, UCT's Prof. Aubrey Mainza and Dr. Indresan Govender, now with the University of KwaZulu-Natal, will present a short introduction to the potential use of PEPT in developing comminution and classification models for design, optimisation and control. The traditional nature of comminution modelling based largely on empiricism has made steady gains over the history of minerals processing. However, in the current climate of diminishing resources and the demand for more efficient processing techniques the tried-and-tested approach doesn’t provide models with sufficient understanding to allow extrapolation to conditions outside the data set used in their development, resulting in challenges during when employed to test innovative designs, precise optimisation outcomes and can’t be used for predictive control. To build these capabilities in models a theory of comminution based on a mechanistic model governing granular materials and their dynamic behaviour and constituent interactions is required. Advances in theoretical understanding go hand in hand with ever-improving real-world measurements to validate or exclude avenues of reasoning. With the help of PEPT work needed for mechanistic theory development of granular flow with the aim of providing a modelling framework with better predictive capabilities applicability to a wide variety of comminution and classification systems has been initiated at the University of Cape Town working in collaboration with University of Kwa Zulu Natal. The unique Siemens EXACT3D scanner housed at the iThemba labs facility under the care of the UCT Department of Physics and the Centre for Minerals Research as well as the on-site world-class tracer production facilities grant us unprecedented millimetre accuracy with regards to location data acquisition of granular systems. Coupling this accuracy to strong advances of the mechanistic-based models in the field of granular flow describing power dissipation and transport phemomena as well as the implementation of these principles to the numerical analysis of the data distinguishes the quantitative as well as qualitative outputs of our research group. With the newly developed feature of multiple particle tracking within a PEPT context, systems comprised of varied constituents such as size and density, can be interrogated with enhanced precision. The Comminution '16 presentation will showcase the none confidential aspect of the work done using PEPT including measurement aspects, numerical analysis and the modelling techniques employed by the team working on PEPT projects. A tour of the facility can be arranged for Friday for those interested in viewing the system. Prepared by: Aubrey Mainza, Indresan Govender, Maximilian Richter, Gary Tupper, Dawid de Klerk, Lawrence Bbosa, Mussa Lisso & Michael van Heerden. Falmouth best place to live in SW England. Something we have always known! My family has lived in Falmouth for 41 years now and I still have to pinch myself when I walk or cycle its beautiful stretch of coast between the Helford and Fal, its two beautiful rivers. So it was no great surprise to see that the Sunday Times (March 20th) has voted the town, with its "finest blend of rural and urban life" the number 1 place to live in the whole of South-West England. 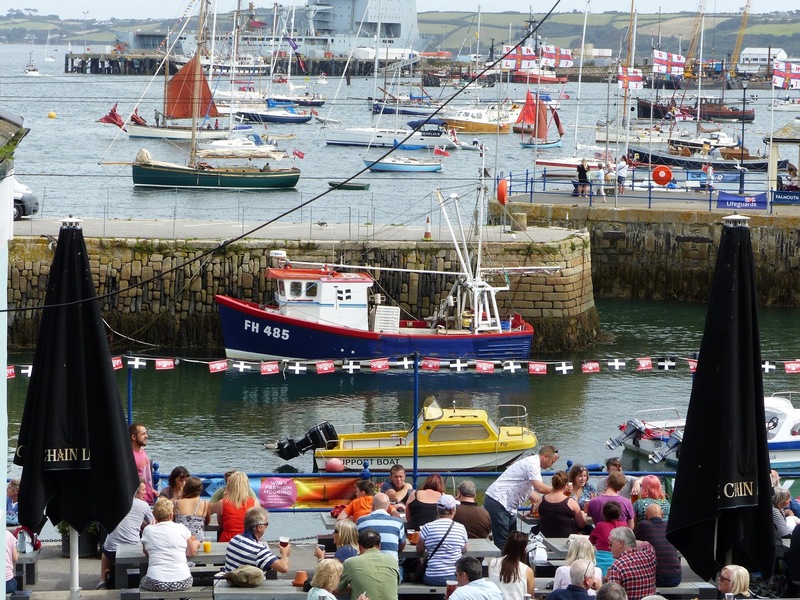 Not only is Falmouth a great place to live it is also a wonderful place to visit, and is an excellent base for exploring west Cornwall's south and north coasts. Thanks to the Maritime rail link between Falmouth and mainline Truro it is possible to get around with no need for a car, and for those visiting, for any reason, but hopefully for a MEI Conference, I recommend that they take a look at the posting 10 good reasons to spend some time in Falmouth. 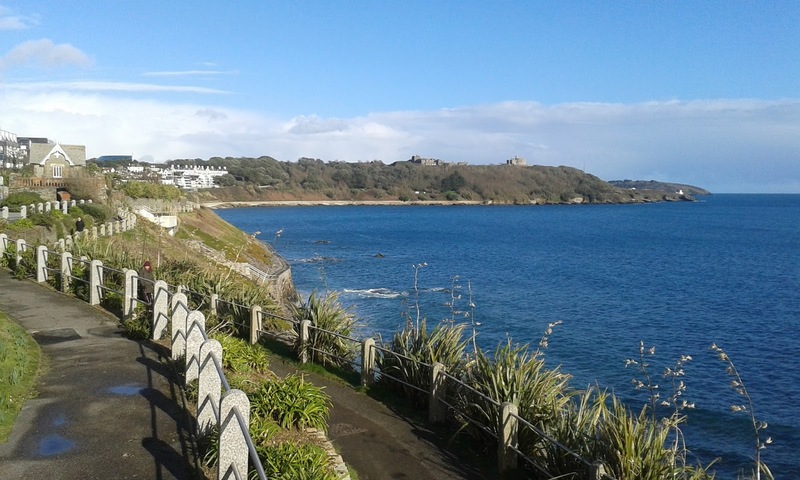 I look forward to showing off Falmouth, its wonderful seafront and Tudor castle, the busy harbour and docks, and its 17th century pub and eclectic restaurants in the old town, at Biohydromet '16 and Sustainable Minerals '16 in June (see also posting of 1st February). A welcome visitor to Cornwall this week has been geologist Richard Edwards, who was a colleague of mine during my 22 years at Camborne School of Mines. He retired from CSM in 1997 and now lives in another beautiful part of England, the spa town of Malvern in Worcestershire. The nearby Malvern Hills, formed from some of the most ancient rocks in England, from the late Precambrian, have helped maintain his interest in geology and he lectures regularly to enthusiasts in the area. This week he gave his first lecture in Cornwall in 19 years, to the local Carn Brea Mining Society, where he guided an interested audience on a tour of mining history, from prehistoric times to the present day. It was interesting to learn that data from charcoal associated with stone tools suggest that the Ngwenya iron ore mine in Swaziland is the world's oldest mine, dating back 43,000 years. The site was known to early man for its deposits of red and specular hematite, used for body painting and rituals. In the 1960s and 1970s Anglo American mined an estimated 20 million tonnes of high-grade iron ore from Ngwenya before the region became a conservation area. Always up for a pub lunch, it was good to get together today with Richard and his wife Veronica, Sheila Parker, wife of the late Roger Parker, who many will remember as Vice-Principal of CSM for many years, ex-Director Keith Atkinson and his wife Maureen, and Mike and Margaret Buzza. Mike is my oldest friend in Cornwall, and was head of physical education at the nearby Cornwall College. 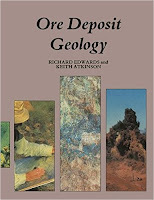 Geologists will know Richard and Keith from their book Ore Deposit Geology, published in 1986. Last night was the inaugural event for CSM's Women in Mining student chapter, and Dr. Kathryn Hadler was the guest speaker. 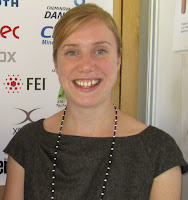 Kathryn is a lecturer in mineral processing at Imperial College, and has a strong track record as a researcher in froth flotation. She is the first woman to hold the post of Editor of the International Journal of Mineral Processing and she gave an illuminating talk "Where are the women in mineral processing", which she has promised to summarise and will be published on the blog in the very near future. The Falmouth Hotel was the venue for last night's Camborne School of Mines Annual Dinner. A short taxi ride for Barbara and me, but others had travelled from all over the world to catch up with alumni and former lecturers. It was also good to see a high turnout of current CSM students (but unfortunately very few staff). There are always faces from the distant past, and one surprise was Richard Thompson, one of my mineral processing students who graduated in 1986, and who I had not seen since. He is now working in the oil and gas industry. Charlie Northfield, a 1980 graduate, I do see quite often now, as he is Process Plant Manager at the Drakelands tungsten-tin mine at Hemerdon in neighbouring Devon. 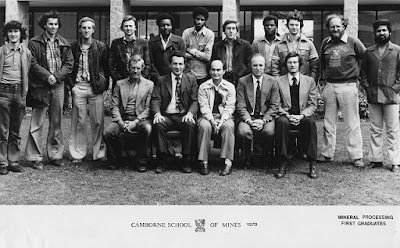 Last night's Guest Speaker was Nick Clarke, who spoke of his colourful career in the mining industry after his graduation from CSM in 1974. 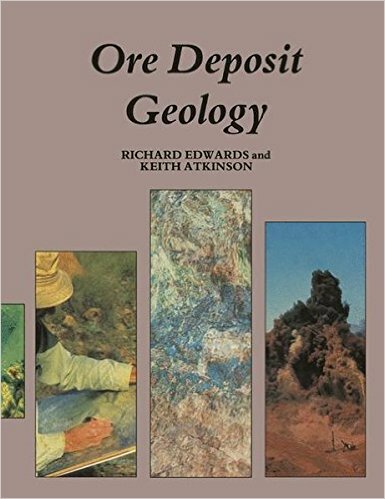 Nick and I worked together on the annual Minerals Engineering conferences, pre-MEI, in the 1990s, when he was Director of CSM Associates. He is now CEO of Central Asia Metals, which, despite the recession, is economically producing copper in Kazakhstan. I asked him if he was optimistic about a recovery in copper prices and he felt that we were probably in for a fairly tough 18 months to two years. I would like to thank Claire Yelland, Secretary of the CSM Association, for her splendid efforts in organising this annual event. A circular economy is an alternative to a traditional linear economy (make, use, dispose) in which we keep resources in use for as long as possible, extract the maximum value from them whilst in use, then recover and regenerate products and materials in urban mines at the end of each service life. By changing the way we view our waste in relation to our urban landscapes we are able to mine – collecting and salvaging – valuable components to be reused and recycled, paving the way towards a zero-landfill future. In order to develop efficient processes for the recovery of metals from both our primary mines and our urban mines, we will need to innovate in process mineralogy and we are pleased to announce that Eric Pirard, professor of Mineral Resources at the Faculty of Engineering of the University of Liege, Belgium, will give an overview of the role of predictive and diagnostic tools in mineralogy to achieve a more circular economy in a keynote lecture at next year's Process Mineralogy '17. Prof. Pirard is head of the GeMMe research group totalling about forty research engineers and PhD students. This group is active in characterisation, processing and beneficiation of mineral materials at any stage of their life cycle. 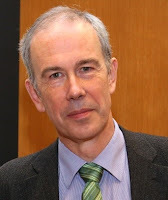 He is also an active member and acts as education officer of the new European Knowledge Innovation Community on raw materials: EIT Raw Materials. This is a consortium of 120 members including major universities, research centres and industries all across Europe. EIT Raw Materials is the spearhead of Europe’s innovation in raw materials and the circular economy with a total budget of close to 3 billion euros to be spent in the period 2015-2022. Prof. Pirard has extensive experience in teaching mining engineers in less privileged countries such as Bolivia, Peru, DR Congo, etc. He is the coordinator of the European Master in Georesources Engineering degree (EMerald) jointly organized by the Universities of Liege, Nancy, Freiberg and Lulea. We look forward to this important keynote, which will complement the geometallurgy keynote of Steve Williams. Nine months prior to these keynotes, Sustainable Minerals '16 in Falmouth will emphasise the crucial role that mineral processing has in contributing to a circular economy, in enabling effective recycling of metals, from WEEE, automobiles and mine wastes. The 10 most popular blog postings in February can be seen below, together with the date of the posting and the total number of comments on the post. We encourage you to share your views by submitting your comments on blog postings. Last month there were over 13,500 page views, so interacting with the blog enhances your international presence by providing you, and your company or Institute, with valuable exposure.